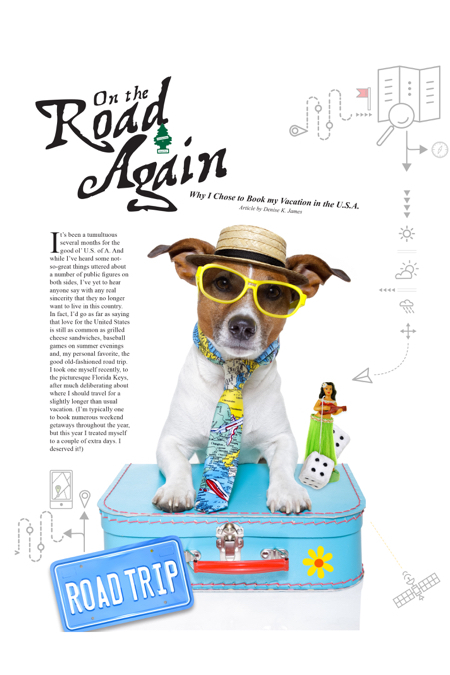 Hilton Head Magazines: CH2/CB2: On the Road Again: Why I Chose to Book my Vacation in the U.S.A.
After searching high and low on my trusty Internet browser and consulting with a bunch of jet-setting friends about my best bets for travel, I came up with the following reasons to stay stateside. Enjoy, and may patriotism run through your veins this summer like a melted popsicle over your fingers. First there is the obvious: money. I love being a writer. It’s fulfilling and different every day. But I don’t always have the Benjamins to sling around when it comes to traveling. Whenever I plan a trip, I also plan by budget. For example, my trip to the Keys was planned in January, and I saved up from January until May, socking away any freelance dollars I could. And you guys don’t need to tell me. I know there are ways to go abroad cheaply, and I know that cruises are usually reasonable (even though I hate boats), but I haven’t found much to financially beat a road trip or a direct flight. Do I dream of hitting Greece one day? Sure, but I still love my mini-vacations in the meantime, and they don’t break the bank. Foreign travel is sometimes not all it’s cracked up to be. I hate to be a Debbie Downer, but foreign travel isn’t always the fairytale you see on other people’s Instagram pages. Things can go very wrong. My good friend who came along to the Keys confessed that the Paris trip I missed in high school was not all rainbows. Practically everyone there got sick with a stomach virus—not my idea of a good time. Our own country has some beautiful places to visit. There are many spots in the United States I’ve yet to see—The Grand Canyon, for example, or Yellowstone National Park. The point is, there’s still plenty of frontier for me here. I don’t know many people who’ve seen everything in this country. In fact, if you’re anything like me, you probably tend to go back to the places you love within driving or quick-flying distance and never cross new ones off the list. So, let’s get better at seeing more of our own backyards, shall we? My Keys friend (she’s my best travel buddy) likes to buy herself souvenirs and then mail them home, where her husband can lovingly receive them and pamper them until her eventual return. That’s if we fly somewhere, of course. If we drive somewhere, it’s even easier to stuff the Toyota till it’s bursting at the seams and drive home with an array of handmade jewelry, used books, local magazines, cute coffee tumblers and…you get the idea. I don’t need an extra suitcase at that point. I just need a spare square of windshield to see through. A lot of people (read: me) get freaked out by the idea of not driving. I’ve heard all the glorious tales of going from country to country in Europe by train, but honestly, all I can think about is how much I hate letting my sister drive when we go home for holiday weekends. I’d much rather rent a car or drive myself and be in control of the situation. Short getaways are totally doable—and fun. I have a confession: I don’t get a lot of paid time off from work. That’s one of the reasons I don’t take long vacations. I would rather have several mini-vacations to look forward to at various points in the year. I tend to take them after big deadlines; a three- or four-day weekend in the mountains or at the beach does wonders for the perspective. Obviously, no one would ever go to Italy for just a long weekend. So, while I’m sure stacking all your annual days off into one awesome trip is worth it, I usually can’t justify it. Instead, I make sure I have several trips to look forward to. The bonus? People on social media think I travel a lot. They don’t even notice it’s just to Asheville or St. Augustine! We’re a melting pot. Duh. Craving some Peruvian food? I just tried it in Miami on my way to Key West. Think of it this way: A little bit of every country ended up in ours. That means there’s always a new kind of food to try and new people to meet. Having Cuban coffee in the Keys wasn’t the same as going to Cuba. But it was still a taste of something different from what I’m used to, which is really what traveling is about. Here’s my advice if you’re craving another culture and you can’t afford to hit up another continent: Visit a bigger city.